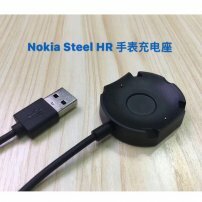 Replacement Wireless Charger Cradle Dock with USB Cable for Nokia Steel HR (Charging Stand) [MOB005980] : Onchee.com - the accessory shop for all your handheld Electronics! You have a lot of reasons to have this charger for your smartwatch - either get an extra at office or a replacement to your smartwatch. It works as your original charger, so skill to adopt.